5/50 : Where in the world is Japan? The more I learn the less I know. While studying the interaction between countries in relation to Japan, I realize I can't picture the routes people took between countries because I don't have a clear a picture of where Japan is (other than the little cartoon plane flying over the ocean you see on a flight to Japan). Even within Japan, I read that someone stopped at ____ island, then went to _____ area in Japan.... Embarrassingly, I have to consult Google regularly. In elementary school at Japanese school we memorized and were tested on all 47 prefectures of Japan. I haven't looked back in 15 years. Now that animated plane over the Pacific Ocean is engrained in my mind, so I figure I should try visual learning. A little contemporary art history sharing: I went to the Asian Art Museum's Tetsuya Ichida exhibit on Friday (and the other two new Japanese exhibits). His paintings are eye-catching but dark in content. They express the burden of social pressures of Japan in vivid, disturbing, but even humorous ways. An ongoing theme seems to be humans as merely a part of social machinery. I think it's a commonly experienced human sentiment, even outside of Japanese society. A slightly more lighthearted painting below- Japanese salarymen crammed into a train reflects reality, but each is like a lifeless clone boxed up and shipped off to work. The next painting is a typical Japanese classroom. Students appear as clones or some sort of studying machine. The artist was hit by a train at age 31 (most likely suicide) but produced 186 completed paintings in 10 years! These are really meticulous paintings, I mean look at that wood grain on the floor of the classroom! As is the pattern of artistic fame, his success came after his death. A book on display in the exhibit was a compilation of his paintings alongside sketches with notes for planning his pieces. He sketched scenes of his dreams, silly drawings, imaginative figures... I need to become better friends with my sketchbook. Though I have yet to see one, I get intimidated by the idea of a "masterpiece-filled sketchbook" that "real" artists have. How do I get better at drawing? By drawing. How do I get better at writing? By writing. How do I get better at cooking? By cooking. How do I get better at _____? By DOING. If you're wondering, yes I do talk to myself! It's inevitable since I spend most of my research/grad school study time alone. I wish there were shortcuts. Learning always takes time. I wonder if that's why the Christian life takes a lifetime plus eternity to learn, be changed, and for our character to be more like Christ. How do I get better at painting AND learn Japanese/East Asian geography? DOING. 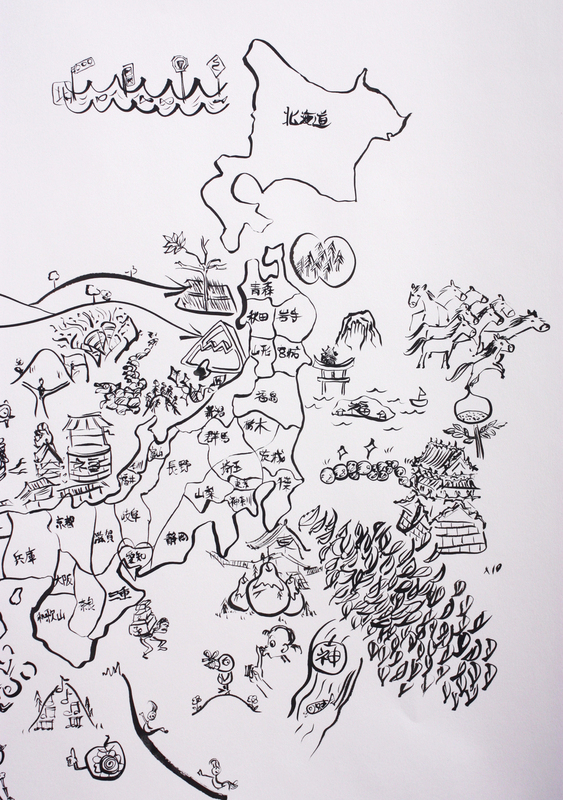 So I sat down to paint a map of Japan, and couldn't stop for 2.5 hours until I finished all 47 prefecture drawings. It was the most fun I've had painting for a long time! 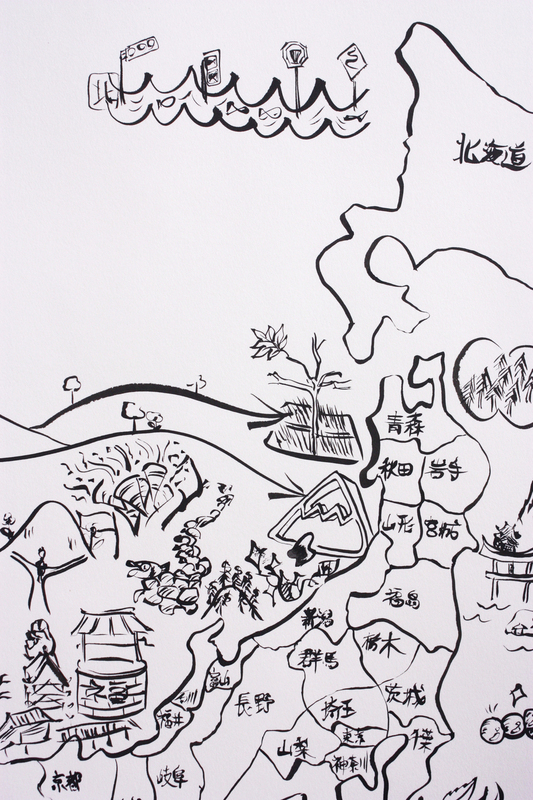 The paintings are a literal description of each of the Chinese characters that make up the prefecture names that the little sketch is next to. I LOVE PUNS!! This is the whole thing, and the rest are zoomed in so you can see each scene. IT WORKED! 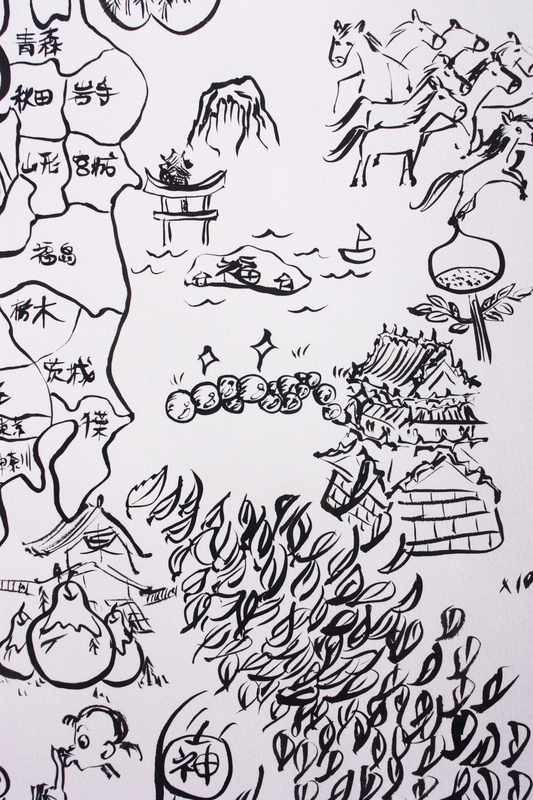 When reading something later, I knew where prefectures were because of the mental image of a "baby deer island" (Kagoshima) or "large divide" karate chop hand (Oita) from this painting. Perhaps there is a pun-loving nutcase artist hidden inside after all.